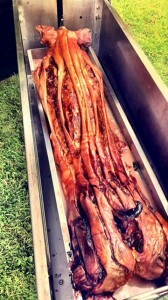 18th Birthday Bash At A Riding School With Hog Roast Coleford! Horse riding devotee Molly has been avidly attending her local riding school since the age of 5 and during that time has become an accomplished rider who has even started helping the teaching staff there give lessons to beginners. With her milestone 18th birthday on the horizon, her family and riding school manager Elaine, could think of nothing better than throwing a surprise party for her at the stables she loves so much! With a guest list of approximately 70 people, they weren’t sure however, how they were going to handle the catering, as the school’s facilities were not equipped to cope with feeding that amount of people. As they wanted it to be a special day for Molly, they didn’t want to let her down in the food department, but having made a few enquiries to other catering companies, they felt like they were asking the impossible. A quick phone call to Hog Roast Coleford changed all that though, as we were delighted to inform them that we could easily cook at the venue and give the birthday girl some great food for her special day! With the preparations all being very hush hush, the Hog Roast Coleford were sworn to secrecy and arrived at the riding school on the morning of the party to freshly prepare one of our classic hog roasts, scrummy side salads and potato wedges. Having sent Molly on some errands to distract her before she arrived at the stables for what she thought was just going to be a normal riding session like any other day, her parents and manager Elaine were there to greet us. They told us timing was everything and we had to be ready to surprise Molly with our perfect pork at exactly 12.30pm, along with all of the other guests, who would be hiding, rather than riding, ready to give Molly the surprise of her life! We assured the party planners we would be ready bang on time, as we pride ourselves on our punctuality, as well as our great food! When the birthday girl arrived, everything worked like clockwork. Molly was absolutely stunned when she realised what was happening, but luckily we were there to help her regain her composure by presenting her with one of our hallmarks roast pork butties! Thanks to some careful plotting by her nearest and dearest and Hog Roast Coleford’s ability to cook great food in any location, Molly has an 18th birthday she will never forget! The answer to every Christmas question.